As in life, this human tendency to make sense of things is precisely that which engaged audience members responding to the dance works in the festival. Spending time with dance helps us practice storytelling in collaboration with the artists sharing their work, as we fill in the gaps and link the images from the stage, in an effort to make sense of things. Quenching our thirst for narrative, casebolt and smith discussed the potential meanings of their gestures in O(h), using dance as demonstration with an ongoing verbal conversation, which, at times, evolved into song. “People like our work because we usually tell you what the dance means in effect satisfying your need to know you’re right.” casebolt and smith stated in unison. While it can be a relief to have the artist tell you what a certain gesture intends, and the artists did show us how the same movement can have different meanings, this easy and direct delivery squashed my curiosity, as they painted dance to be solely representational, suggesting that every movement possesses a meaning that can be translated in words. Others who I spoke with as a performance docent enjoyed the sort of lecture demonstration style since it gave them access into the mind of the artists and their process. Rapidly batting dialogue back and forth, the artists’ relationship to each other is deeply attuned. For the finale, the pair improvise to develop a song and dance together. The playful, live creation included humorous moments as one would direct the other how to mime an exaggerated heartbeat guiding clasped hands to touch and extend from the chest, as if we were watching a rehearsal. While entertaining and informative, the choice of casebolt and smith to dwell on the question of what a dance means flattened what the dance could do. Also addressing the desire to make sense of things, Rachael Lincoln and Leslie Seiters in People Like You, frame their work through narration, which in this case, has a more dimensional and invitational effect. Following an initial sequence during which Seiters and Lincoln observe themselves holding round illuminated mirrors, they stand at a microphone reminding us that “We tell ourselves stories.” They ask after our expectations and even request that when they get to the end of the dance, we “pretend it all works.” From there the duet evolves into a compelling yet disorienting epic. Film segments show the faces of the artists from a perspective similar to that of the mirrors held as the artists closely study their faces, pondering and perhaps checking for the changes of time in their skin. Sound plays a major role in this work and the combination of the ticking metronome downstage, with film images of a pregnant Seiters and Lincoln wearing a cast of a pregnant abdomen live, points to the passage of time allowing the past and present to be in conversation. When the two pitch forward from the waist, their arms swing, keeping the pace like the metronome, and when they partner, both careful and responsive, they explore fixed points and freedom of the limbs, directing each other and alternating in control. When the two freeze, facing each other center stage, a brightly-dressed ensemble, burst out to the sounds of Balkan brass for a cinematic and surreal jamboree. They swiftly place white squares on the floor creating a chessboard pattern around the frozen duo and pair off for a frontal-facing dance. Disappearing as fast they emerged, the ensemble inserts a powerfully visual interruption. A sequence of Seiters and Lincoln handling toy zebras follows, like Noah’s Ark animals boarding two-by-two, shadows looming large on the curtain behind. Later, again using sound, Seiters collapses onto a table and manipulates a microphone skimming it along the surface with Lincoln underneath. We have all heard someone walking on a floor above, sensing the presence of a person without seeing them. The cryptic sound of Seiters’s movement above the table evokes the womb experience of a yet-to-be-born baby, as Lincoln could sense but not see. The work also concludes with sound, a visceral pounding by the ensemble from around the house and then darkness, abruptly and completely. During the Dance and Discourse workshop Saturday, June 1 at the ODC Dance Commons just prior to the final program of Scott Wells & Dancers, Brian Brooks and ODC Dance, festival goers wrestled with their own construction of narratives based on the work of festival artists such as Leslie Seiters and Rachael Lincoln, Kate Weare and Company, Nicole Klaymoon’s Embodiment Project and casebolt and smith. Co-authoring meaning with the festival artists and fellow audience members, participants discussed associations with the maternal clock and also drew parallels of how the arm swinging movement of Seiters and Lincoln, closely matched the repeated move of Weare’s cast during The Light Has Not the Arms to Carry Us. Weare’s dancers, however, execute the same movement with a coiled and bound energy, present in both of the company’s works on the program. Of Weare’s Drop Down, a ferocious duet by Leslie Kraus and Luke Murphy, workshop participants noted an increased awareness of the footwork with the dancers performing tango-like steps and sequences while lying down, giving the audience a sort of view from below. It was the film images and mirror view from People Like You, that elicited the observation in Drop Down, a result of the festival structure, keeping memories concentrated and close to the following performance. Drop Down makes a martial art of tango. When separate, the dancers seem to be shadow boxing as much as dancing. When together, their firm exchanges convey tensions: the dance in combat, as well as the fight in an embrace. With a similar attack and precision to Weare’s artists, Brian Brooks’s San Francisco debut in I’m Going to Explode, to the LCD Soundsystem’s Losing My Edge, also exhibited affinities to Nicole Klaymoon’s hip hop-trained dancers in his play with isolation, speed and slow motion. After removing the jacket and shoes of his business suit, Brooks extends his limbs distally. Brooks uses his torso as axis around which he coils and releases. His mathematical progressions of arm extensions reverberate into groovy retrogrades of his actions and sometimes outbursts of the running man. 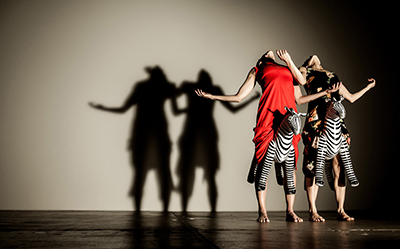 Both Brooks and Weare’s dancers, based in New York, exhibit a sculpted specificity and high intensity distinct from the other works in the festival. Also weaving language into performance, Klaymoon’s House of Matter posits “Maybe home is an action, not a place.” The poetry and song about women, violence and love, combined with hip hop dance features the individuality of Embodiment Project artists, who create a cipher, taking turns in the spotlight. Singing from upstage, the velvety voices of the musicians braid vitality and triumph with the challenges addressed in the poetry. “I’m a walking historian with amnesia,” Klaymoon recites as she tiptoes and pop-locks among four men dressed in white, peacefully lying prone, hands folded in prayer. Where Brooks brings fluidity to his hip hop infused phrases, Klaymoon’s artists lock into postures and reverberate, alternating speed with suspension as if moving through a viscous serum. The movement also speaks to that of Seiters and Lincoln in the play of fixed points and freedom of isolated body parts. While House of Matter relates to a metaphorical place, ODC Theater Artist-in-Residence Scott Wells’s Parkour Deux addresses relationships to a physical environment. Cityscapes suggested by large moveable mats and the brick walls of the theater compose the set. The artists seem to stand atop buildings and dart across the landscape, diving off ledges and catching each other with exacting timing. The manipulation of mats suggesting unstable ground seems appropriate for a city like San Francisco built along a fault line. Within a festival featuring many duets, the cast of Parkour Deux extends partnering to include the mats and walls, a presence with environment. Finally, when the ensemble breaks the risky athleticism to enact a ballet class barre exercise, the juxtaposition of dance’s indoor kids with the urban warriors of parkour make the latter group appear immensely more powerful and free. While, ironically both Parkour and ballet are French inventions, Wells brings the two together with a light touch. ODC Dance in KT Nelson’s Cut Out Guy, captures the thrill of men diving and catching one another, with the athleticism of Scott Wells’ artists, and an additional layer of deep emotionality evoked by Ben Frost’s score. As the all male cast nimbly support and carry each other, deft lunges and slides stir a youthful energy among the dancers. Again we see duets within the ensemble, both tender and firm in their partnering. Apparent within the festival context, similarities emerged between the horizontal floorwork of Drop Down, based on tango and the floorbound sections of Cut Out Guy inspired by wrestling. Nelson’s work has a hustle to it, punctuated by soaring moments during which men are lifted and floating, like humans in the sky of a Marc Chagall painting. With storytelling, we think we believe what we see, but really, we see what we believe. The WDDF-SF offered opportunities to co-author our own stories with the artists shaped by our values and experiences with which we fill the gaps. Every performance speaks to the last work seen, and with the festival melting pot of artists, the stories layer and collide for a rich microcosm of contemporary performance today.